I’m Mrs Family of 5, I’m 21 plus a decade or so but who’s counting eh! Until we embarked on this very exciting journey I had always worked full-time, for now though, I’m a stay at home mum. My husband and I have been together for over 10 years :0) We have 2 cats and we used to have a relatively quiet yet spontaneous life. Adoption was our first choice, although we did have a period of ‘trying’ obviously unsuccessfully, maybe it didn’t happen because we knew it wasn’t the right path for us. We adopted our 3 Daughters in 2010. They were then aged 3, 4 and 5! Yes you read it right, I did say 3, 4 and 5! Thats when my world got turned upside down and everything I thought I knew, I realised I didnt, and everything I thought I was prepared for, I realised I wasnt. I have just discovered your blog and ended up reading through it for 2 hours! I am a mom of three too, aged now 7,8 and 10. I always wanted to adopt children but had my own a bit too fast. I have been fascinated by your story and the story of your girls, both as a mother and as a teacher. Working with children with similar backgrounds to yours (sometimes), i found it very informative to see the other side, the life at home as opposed to behaviour at school. Although, as you stress, being an adoptive parent is different to my parenting, i was. Quite stricken by the similarities too! My children compete for my attention constantly, they ruin things i buy or make for them without (or so it seems) a second thought, and my youngest is forever copying her older siblings, begging for their love which they just find very irritating. My middle girl also experiences sleep problems (although i know that she’s been like this since she was born) and extreme behaviours such as toddler tantrums. Of course i know she has not suffered any traumas other than being the middle child and having a hyper active imagination. Oh, and i feel like you too! Although i gave birth to them, parenting is a really tough job, especially when you are trying to do it well and when you have a fair amount of children without much age gap! This is a very long comment, sorry! Thought it might help for you to know that you are not alone and although your story is different from mine, i feel i can really relate to you. Wow, and you’re so young! I found your blog via The Boys Behaviour and will be following avidly. I too have 3 children, all fairly close together – it’s a difficult journey at times and I’m sure adding ‘adoption’ into the mix will make it even more ‘interesting’. Looking forward to reading more…. Okay so I’ve now read again and realised you’re not ACTUALLY 21 lol!! 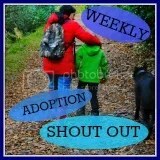 I found your blog from a link put on the AdoptionUK message boards. I have skim-read most of your blogs, and read some in depth, at times with tears running down my face. The reason for the tears? I know what it’s like. I’m there with you through all the difficulties, the strange behaviours, the looks and comments from other parents, the knowing something’s wrong with one of your children but they can’t tell you what – they just show it. The tiredness and stress and hassles with professionals, the decisions about schools, the appointments, the strops, the shouting, the refusals to go to bed, the refusals to get up, get dresed, eat, cleasn teeth, go to school, do homework and so on and so on. But then also the love, the hugs, the lovely surprise when they do something they couldn’t do yesterday (and probably can’t do tomorrow!). They’re our kids and we love them regardless but it’s so difficult, and so not what we expected regardless of how much training we did. So thank you for writing it as it is, and I will be back to see how the family of 5 copes with moving schools, and wish you a good summer holiday despite all the changes. Couldn’t have put it better myself, its lovely to know i’m not alone!! Glad you liked my blog and so happy you found it useful!! Come back and let me know how you get on 🙂 look forward to hearing more from you. will do, thank you – feel free to check out my journey on my blog and give advice! Your blog is so sweet and touching. Thanks! Great blog! We just wrapped up the adoption of our 15-year old and got her older sisters as a bonus. We don’t need legal documents for them to be family. I love seeing families created with older children, especially sibling groups. I know you probably hate it when people say “The kids are so lucky you adopted them,” because we all know that we are the lucky ones to get to play this role in their lives – forever. Congratulations on your wonderful family, may they raise you right!